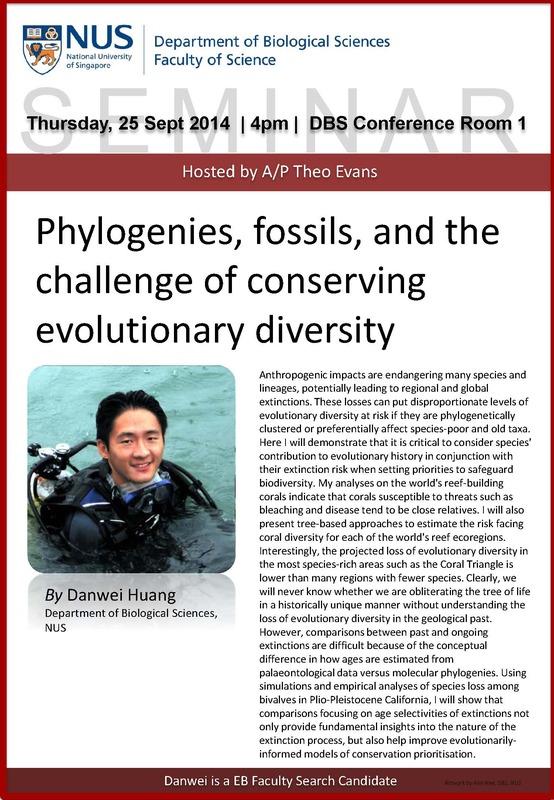 The Lee Kong Chian Natural History Museum (LKCNHM) of the National University of Singapore invites applications for a Museum Officer position. For more information about the Museum Officer opening, visit the job opportunity page at News From Lee Kong Chian Natural History Museum. The closing date for applications is 10 October 2014. Abstract: – Infectious diseases are emerging in real time, with the current epidemic of ebola in West Africa taking the headlines at more than 1,900 human deaths over the course of March to September 2014. Infectious disease emergence is a field that spans studies of wildlife, domestic animals, and humans, and is not only relevant in times like this, but also globally important in times of non-crisis. Overall, I will study the linkages between ecological and human systems to understand how these connections and interactions may affect risk of emergence, and ultimately how control and policy may fit in. Factors that are drivers of disease and dynamics may be affected by aspects and behaviors of both human populations and animal populations. The goal is to characterize and manage risk by examining connectedness, risk, and control allocations or actions that may be contributing to disease emergence. In order to capture how various factors may impact risk, this proposed PhD thesis approaches the modeling of the emergence of infectious diseases from multiple scales: global national, continental spatially explicit, regional, and landscape. In the first chapter, global official development assistance will be collated and compared with risk of emergence. The second chapter will look at Africa land use projections as a result of economic development and other ecological factors to understand how development activities may be managed to reduce future risk. The third chapter examines the trade connections in the Southeast Asian region, an area that may be considered a hotspot for biodiversity and development as well as disease emergence. In the last chapter, a case study in Thailand is proposed that follows human movement and connects it to mosquito sampling and clinical records of dengue and malaria in people. 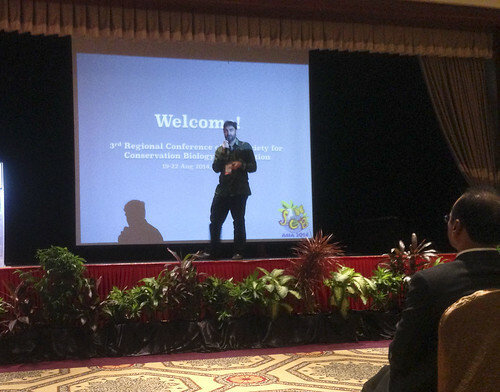 Marcus Chua reports the list of NUS Biodiversity Crew and alumnus who presented or was present at the 3rd Asia Regional Conference of the Society for Conservation Biology – Asia Section – what a party! Let me know if we missed anyone. Marcus also made a great effort to tweet updates to those of us stuck in campus and has compiled his posts, as well as those of others in this Storify compilation. Photos by Marcus Chua. Thanks Mary Ruth and Mingko for a bunch of updates!